The program will prepare the next generation of computer and games enthusiasts for game design and development, play theory, and engagement strategies. American University has launched a new Master of Arts in Game Design degree, a unique, multi-disciplinary program that will prepare the next generation of computer and games enthusiasts for game design and development, play theory, and engagement strategies. 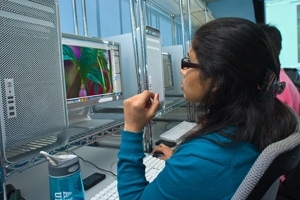 The degree program, offered through a partnership between the AU School of Communication and the College of Arts and Sciences, provides students with an immersive curriculum that spans communication, computer science, and art. Students who pursue the new master’s degree will develop skills beyond traditional game design and development by learning to tailor play design to meet specific goals in player impact. During the second year of the degree program, students will intern at the AU Game Lab Studio and build a professional portfolio from working on real world projects for external clients. Students who graduate from the program will take on positions as designers, developers and games administrators who can apply game-related insights to creatively solve problems and innovate. The Studio is part of the AU Game Lab, which serves as a hub for professional education, persuasive play research and practice. The Studio provides contract work for external clients in need of game development that will engage and influence around a campaign, a concept, or a brand. The MA in Game Design was developed under AU’s Persuasive Play initiative, which aims to employ the power of play to create socially responsible games that enrich people’s lives. In persuasive play, game design is created in a way meant to transform players’ interests, activities or opinions into meaningful action. For example, in the field of K-12 education, persuasive play games are helping educators find more effective ways to engage with broader and more diverse students. AU’s Persuasive Play Initiative is led by game designer and researcher Lindsay Grace who is also the director of the AU Game Lab. Grace and other faculty members have created successful games and bring research expertise to their teaching. Grace has created some of the most celebrated independent games in the world, including Wait, identified by the Games for Change Festival as one of the 10 best social impact games of the last decade. Treanor and newest faculty member Josh McCoy helped to create Prom Week, a social simulation game that was a finalist in both the Independent Game Festival and Indiecade. For more information, contact gradcomm@american.edu or gamelab@american.edu. Graduate applicants may apply directly to the program by mail or online.